A small village of Maharashtra, it is blessed with the best gifts of nature. The magnificent foliage and the luxuriant greenery of the area make it an ideal place to spend your holidays in a perfect way. With the amazing background of the majestic Sahyadri and magnificent valleys near the marshland, it leaves the visitors fascinated. Other things which add to the beauty of this place are the large number of magnificent cascades, rugged topography and the Rocky Mountains. It is quite popular among trekkers, as it offers a challenge to the people who have a fascination for trekking. Trekking here during the monsoon season has its own charm as the challenges and the beauty of local scenery during that time will surely take your breath away. Kolad is the house of one of the fast flowing rivers of South India, which is renowned by the name, “Kundalika River”. The water from the nearby dams keeps the river at its full power all the time. This river bed is an ideal location for people looking for some type of adventure in their lives. 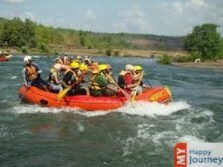 River rafting is one of the popular adventurous activities here. On this 14km long river, a rafting trip of one and a half hour is offered, where you have to pass through a large number of rapids, which vary in strength and density. It’s a sport of great courage and bravery and is at its acme during the monsoon season, when the water level in the river is quite high. Apart from river rafting on Kundalika River, this place offers many other water activities as well, which include kayaking, Paragliding, and river crossing. Boating through this powerful river, with the background of lush green forests, offers an unforgettable experience to the visitors. If you are among those who enjoy the warmth of nature, then this is the place for you to be.